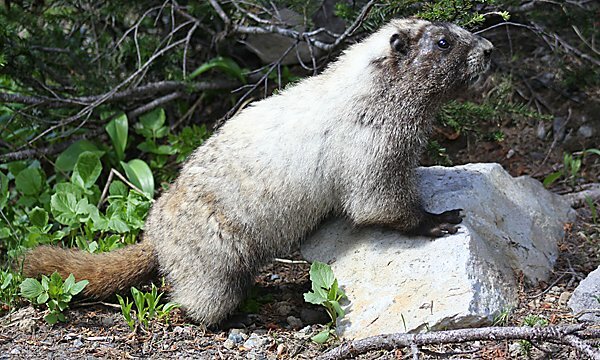 Hoary Marmots, also called Whistle Pigs, inhabit rocky areas near the treeline in northwestern North America up into Alaska. Their warning whistles when danger approach are one of the coolest noises one is likely to hear when exploring northwestern mountaintops. 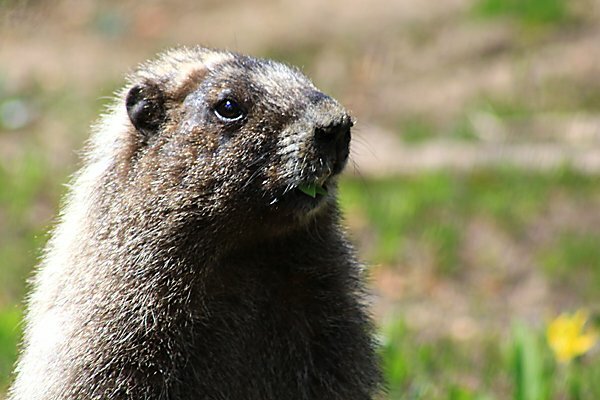 And marmots, of course, are nothing but pretentious groundhogs, so the name Whistle Pig seems like an extremely fair appellation. 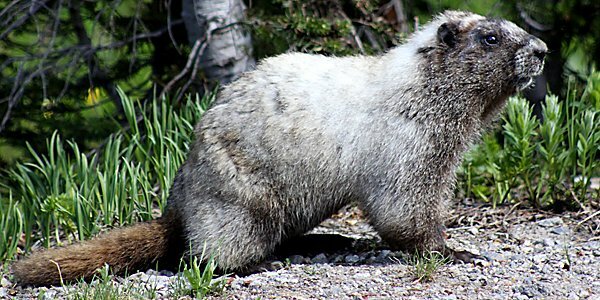 The “hoary” part of their common name refers to the extremely pale fur on their back. 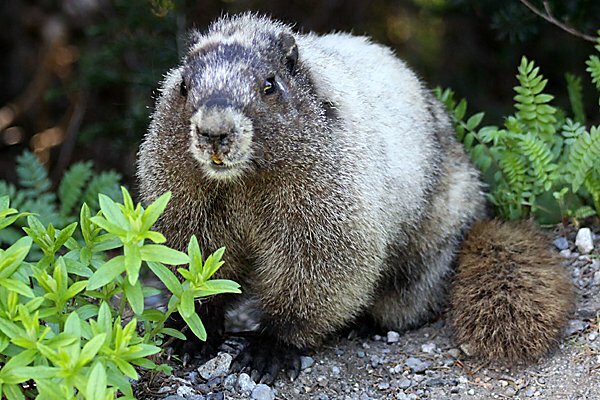 The Hoary Marmot featured in this post was spotted along a service road in the Sunrise section of Mount Rainier National Park. It was completely unconcerned with our presence and approached to within a few feet of our feet, allowing for some fun pictures. 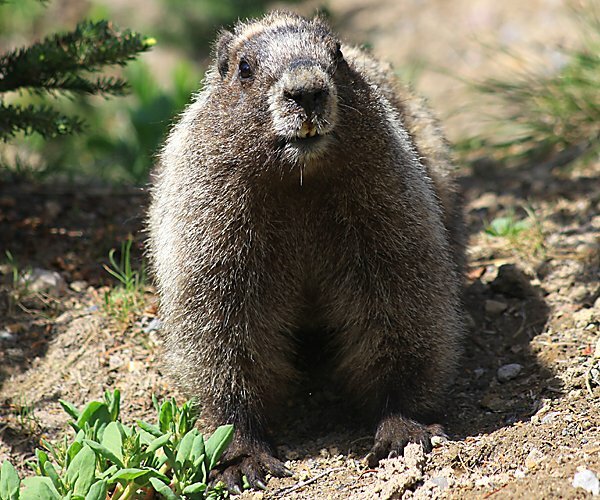 Of course, when the marmot first approached I was lugging a sleeping toddler, so some of the pictures here were actually taken by Daisy before I could find a suitably shady spot to lay Desi down in order to retrieve my camera from her. 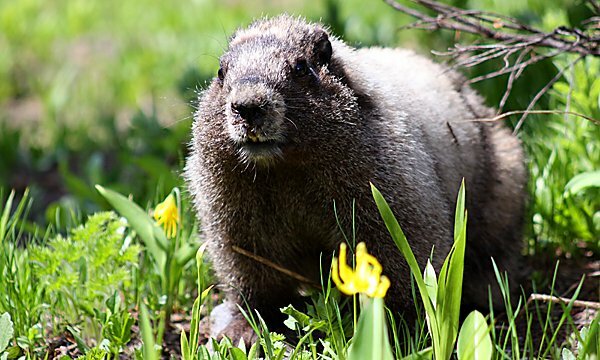 Once the marmot wandered off I gathered Desi back up again and, of course, the marmot came back out for an encore appearance which Daisy again ably photographed. Anyway, about half of the pictures here were taken by Daisy and the other half by me. 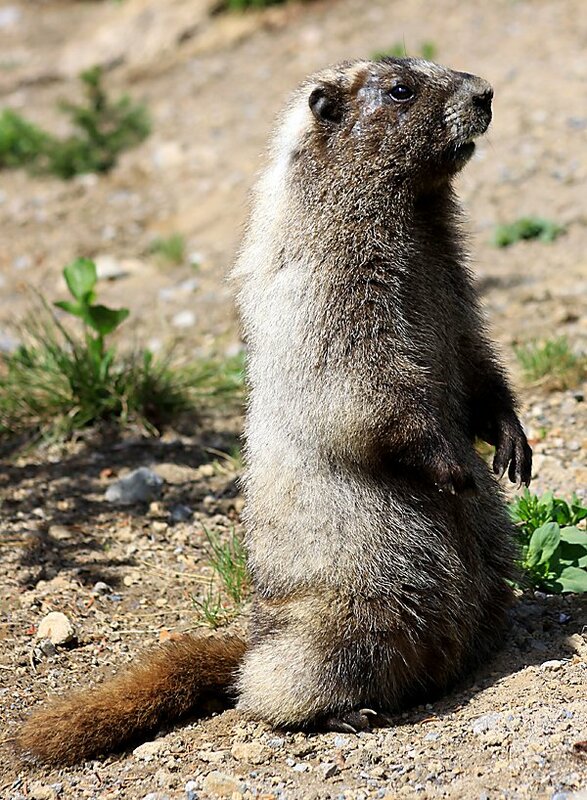 All of them are of the same cooperative Marmota caligata, an adorable member of the marmot tribe. How big are these animals? Chipmunk size or racoon size? Vegetarian we presume by the green stuff between it’s teeth in the last shot! About the size of a large raccoon. Pretty big. And, yeah, vegetarian! Why Do Cliff Swallows Flutter Their Wings When Gathering Mud?